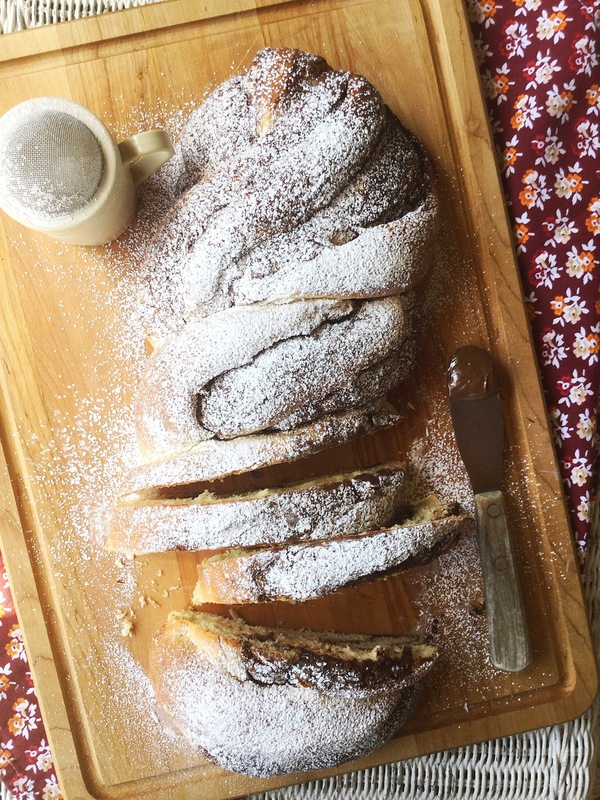 What is better than warm homemade bread filled with Nutella? Whenever I get an idea for a bread recipe I always start with my trusty challah bread recipe. It has a nice tender texture, but it’s also able to hold up to whatever I fill it with. This time around I kept the filling super simple and classic. 1)When making bread I always find it helpful to read the recipe throughly before beginning. 2)This bread is best eaten the day it’s baked, any leftovers should be stored well covered. This bread makes an amazing breakfast! I have a recipe coming soon for any leftover bread you may have. So be looking for part 2. 3)I love the ripples of Nutella throughout the bread. BUT don’t go over board with the filling. I don’t have measurements for the Nutella, just spread enough to cover the rolled out dough and that’s it. If you overfill the loaf it will ooze everywhere and cause a mess. 4)I find that the laundry room is a good place to rise dough. I place the bowl on the dryer and close the laundry room door. Prepare the yeast: In a two-cup measuring cup sprinkle the yeast over the warm water and add a pinch of sugar to help activate the yeast. Stir to dissolve the yeast and allow to stand for about 10 minutes or until you see a thin frothy layer over the top of the water. In the bowl of a stand mixer, whisk together the 4 cups flour, sugar, and salt. Making a well in the center of the flour add in the eggs, yolk, and oil. Pour in the yeast mixture and whisk to make a slurry. Switching to a wooden spoon mix until you form a shaggy dough. Using a stand mixer fitted with a dough hook, knead the dough on low for about 6-8 minutes. If the dough still seems very sticky add a little flour at a time, about one Tablespoon. The dough is finished kneading when it’s soft, smooth, and forms a ball. Place the dough in a oiled bowl, covered with plastic wrap, and place in a warm place for about 1 1/2 – 2 hours or until doubled in size. Once the dough has risen, remove the dough from the bowl onto a well floured surface. Roll into a rectangle, about 3/4 of a inch thick. Then, spread a layer of Nutella over the rolled out dough. Now, roll the dough up, starting with the side farthest away from you rolling the dough towards you. Next, cut completely down the center of the dough, end to end. Turn the sides up and carefully twist the dough….I start from the middle. Such the ends underneath the twisted loaf. Gently place the loaf on a baking sheet lined with parchment paper or a silicon mat. let the loaf rise for 1 hour. Bake the loaf in a preheated oven at 350 degrees F. for 35-40 minutes or until the bread reaches an internal temperature pf 190 degrees F. and is golden brown. You can enjoy this bread right out of the oven. I love to dust the top with powdered sugar. Enjoy!